It’s not all that unusual for musicians to talk the talk about taking a less-is-more approach to their work – but it’s rare indeed for artists to really walk the walk, and apply that philosophy across the board. Over the better part of a decade, Shovels & Rope have done just that, cutting unnecessary frills from their songs, not to mention the very way they live their musical lives. Mississippi-born, Nashville-bred Cary Ann Hearst and Texas-born, Colorado-raised Michael Trent forged singular paths as solo artists before connecting – both musically and personally – in Charleston, South Carolina. While they’d both had burgeoning solo careers (Cary Ann earned kudos for her 2006 album Dust and Bones, Michael with his band, The Films, as well as his own solo outings), they quickly found that both their voices – which entwine with eerie beauty in their haunting harmonies – and philosophies matched up perfectly, and a beautiful partnership was born. 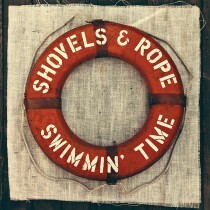 On Swimmin’ Time – a title that nods to the aquatic theme running through the disc’s songs — Hearst and Trent bob and weave through a combination of witty, playful tales (like “Fish Assassin”) and brooding murder ballads (like the horn-tinged New Orleans shuffle “Ohio”) with a rare combination of intimacy and swagger. They know when to grab the listener by the shoulders and shake (as on the fiercely roiling opener “The Devil Is All Around”) and when to put a caring arm around those same shoulders in order to spin a gentler yarn (like “After the Storm,” a tale of surviving rough waters, both literally and spiritually). 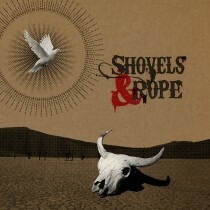 Those live shows have played a huge part in building Shovels & Rope’s reputation among audiences and their peers – the latter of whom voted the duo in for two 2013 Americana Music Awards, Emerging Artist of the Year as well as Song of the Year (for the vivid, semi-autobiographical “Birmingham”). Over the past two years, Cary Ann and Michael kept their sleeves rolled up and their voices raised, an M.O. 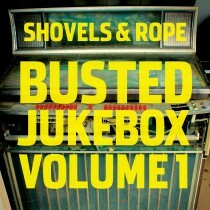 that helped them eventually sell more than 60,000 albums the old fashioned way – reaching one listener at a time, and making each one feel like part of the Shovels & Rope family. As a result, they were able to trade their well-loved and road-weary van for an R.V. and segue from tiny, sweat-soaked dives to larger halls, not to mention eye-opening performances at events like the Newport Folk Festival, Coachella and Lollapalooza. They may have had camera crews following them – for the intimate, revelatory documentary The Ballad of Shovels & Rope, which has been making the film festival circuit this past year – but they didn’t cut back on what Cary Ann calls “windshield time,” and certainly didn’t let their egos grow in tandem. 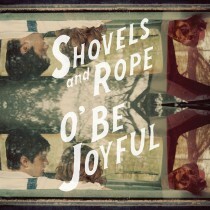 While they didn’t start showing up in the tabloids as a result, “Birmingham” (the number- one song on American Songwriter’s year-end list) and the rest of O’ Be Joyful did put Shovels & Rope on the larger stage in many ways – from an appearance on the Late Show With David Letterman to an acclaimed set on Austin City Limits. But as they continue to prove, night after night on tour, they aren’t about to put their blue collars into mothballs. Cary Ann jokingly says, “We keep getting more famous, but we aren’t getting any better,” before turning serious.